The ICDA meeting scheduled for Tuesday, March 19, 2019 at 6:30 p.m. has been cancelled. Borough offices will be closed on Wednesday, March 6, 2019 from 1:30 to 4:30 for maintenance issues. Electric payments can be made online Pay Bill Here or checks/money orders may be placed in the drop box at the rear of Borough Hall (60 W. Emaus Street). 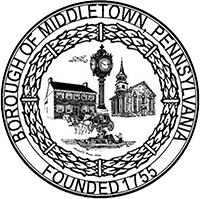 The snow emergency for Middletown Borough has been lifted, effective immediately. The Middletown Human Relations Commission is hosting Middletown’s Community Art Show on Saturday, March 30th, 2019. It will be at the MCSO building at 60 W Emaus Street in Middletown, from 1-4PM. On display will be artwork from students and members of the Middletown community. Light refreshments will be available while supplies last. For more information please visit the Human Relations Commission site at https://www.facebook.com/events/592670874532093.